The Domo Appstore gives you all the tools you need to customize our business intelligence platform exactly as you like it. With around 1,000 unique applications available, the Appstore allows you to pick and choose the software that best helps you solve your company’s individual business problems. In our App of the Week series, we’re shining a spotlight on a few of our favorite apps and taking a look at how they’re helping our customers get even more out of their data. Today, we’ll be discussing a predictive analytics tool for sales managers called Sales Forecast Accuracy – by SolutionStream, a premier partner in Domo’s Appstore. SolutionStream is a world-class custom development shop that provides end-to-end solutions for companies who need a rock star team to build their mobile applications, enterprise cloud systems, or data visualizations and dashboards. From startups to Fortune 500 companies they have tackled more than 2000 difficult software and data problems, and given clients the solutions, insights and competitive advantages they need to drive results. They utilized this wealth of experience to produce an incredible app that takes the guesswork out of reporting on sales. Sales Forecast Accuracy helps you predict sales performance with precision and speed. For sales managers, few parts of the job cause more anxiety than trying to figure out whether their teams are on track to meet their monthly or quarterly sales goals. Indeed, while sales professionals essentially live and die by their ability to hit these targets, it can be both difficult and time-consuming to gauge progress over the course of any given time period. On average, the typical sales manager spends about two hours each week predicting performance, and nearly 75% of sales organizations ultimately miss their forecasts by more than 20%. Sales Forecast Accuracy allows you to confidently predict where you’ll stand at the end of the month or quarter—without having to maintain a bunch of complicated spreadsheets. The app makes real-time predictions by comparing your historical performance to forecasts provided by your sales reps and team managers, informed by daily updates from your CRM. This allows you to see where your sales should be on every day of a given period, taking into account the parts of the month or quarter when you typically book your sales. Make sure you’re on pace to meet your goals—before it’s too late. In addition to helping you measure your progress, the Sales Forecast Accuracy user interface allows you to visualize your data and identify the underlying factors responsible for your failure or success. If things aren’t moving along as they should be, you can analyze past performance to set more realistic goals or make strategic changes to get things back on track before the end of the sales period. For instance, you might see a graph telling you that one of your best teams is not performing up to its usual standards during the month of September. While you might otherwise learn this information only after the fact, Sales Forecast Accuracy gives you advanced notice so that you can call a team meeting to better understand where things have gone awry and what you can do to help your employees improve performance during the home stretch. In fact, the app even allows you to drill into individual prospects so that you can identify roadblocks in the sales pipeline and strategize new tactics for closing the deal. 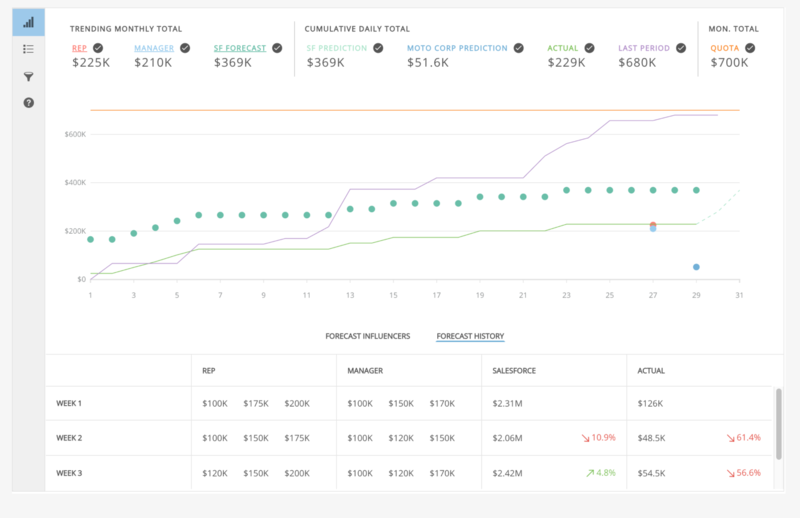 With Sales Forecast Accuracy, you can rest assured that you’ll have good news to share with your bosses at the end of every month. Or, at the very least, you’ll know ahead of time when bad news is on the horizon. Want to learn more about how Domo apps can help you make better decisions?